I am particularly attracted to the analysis and modeling of macromolecular machines whose actions and interactions are essential for cellular function. 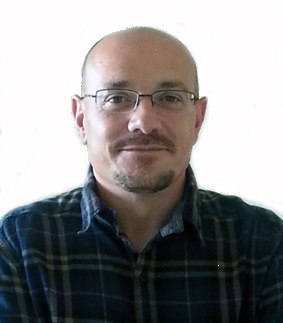 My research interests include new hybrid methods to combine multiresolution structural information of complementary biophysical techniques (X-ray, EM, SAXS etc. ), new methods to analysis and predict the dynamical behavior of these complex systems using coarse-grained simulations (e.g Normal Mode Analysis) and, protein and nucleic acids structure modeling. More recently, I also interested in computer-based methodologies to aid the structure rational design of new active compounds. These research lines are well supported by wide number of collaborations. BSc in Chemistry (1992), University Complutense of Madrid (UCM). Spain. MSc in Biophysics (1992), UCM. PhD in Chemistry (1999), UCM. 1992-1993 Ph.D. Student in the Biophysics Group at UCM. As a graduate student, I received rigorous training in theoretical biophysics and structural biology. Starting from a solid training in mathematics, informatics and biophysics, I worked on prebiotic evolution models and neural networks research fields. The latter founded my BSc work. 1994-1998 Ph.D. Student at the Centro de Investigaciones Biológicas (CIB) of the Spanish Research Council (CSIC). 2000-2003 Associate Researcher at The Scripps Research Institute. CA, USA. My postdoctoral tenure at TSRI at W. Wriggers’ lab provided me the opportunity to broaden my technical experience in multi-resolution structure analysis towards the modeling of the large-scale macromolecular assemblies on the basis of low-resolution density data from electron microscopy. 2004-2007 Tenure track researcher position at CIB-CSIC. I came back to Spain with the Ramón and Cajal tenure track program to establish my own research group to broadly work on the development and application of computational methodologies for structural biology. During this period, I secured several grants as principal investigator. 2007-2010 Research Staff Scientist at CIB-CSIC. Group Leader. 2010-present Research Staff Scientist at Institute of Physical Chemistry (IQFR-CSIC). Group Leader. I currently have a small group of three people including myself. Our multidisciplinary team is trying to ask and answer relevant questions in structure modeling, structure flexibility, protein interactions and drug discovery. Ramírez-Aportela E., López-Blanco J.R., Andreu J.M., and Chacón P. (2014). Understanding Nucleotide-Regulated FtsZ Filament Dynamics and the Monomer Assembly Switch with Large-Scale Atomistic Simulations. Biophys J. 107 (9):2164–2176. Lopéz-Blanco J.R., J.I. Garzón and P. Chacón (2011) iMod: multipurpose normal mode analysis in internal coordinates. Bioinformatics 27 (20): 2843-2850. Garzon J.I., J.R. López-Blanco, C. Pons, J. Kovacs, R. Abagyan, J. Fernandez-Recio, P. Chacón (2009) FRODOCK: a new approach for fast rotational protein-protein docking Bioinformatics, 25, 2544-2551. Garzón J.I., J. Kovacs, R. Abagyan, and P. Chacón. (2007) ADP_EM: Fast exhaustive multi-resolution docking for high-throughput coverage. Bioinformatics. 23(4):427-3. Rueda M., P. Chacón, and M. Orozco (2007). Thorough Validation of Protein Normal Mode Analysis: A Comparative Study with Essential Dynamics. Structure. 15(5), 565-575. Opalka N., M. Chlenov, P. Chacón, W. J. Rice, W. Wriggers, and S.A. Darst (2003). Structure and Function of the Transcription Elongation Factor GreB Bound to Bacterial RNA Polymerase. Cell, 114: 335-345. Chacón P. and W. Wriggers (2003). Multi-Resolution Contour-Based Fitting of Macromolecular Structures. J. Mol. Biol., 317:375-384. Chacón P., Morán F, Díaz JF, and Andreu JM. (2000) Shape and size determination from protein x-ray solution scattering with a genetic algorithm. J.Mol.Biol., 299:1289-1302. Chacón P., F. Morán, J. F. Díaz, E. Pantos, and J. M. Andreu (1998). Low-Resolution Structures of Proteins in Solution Retrieved from X-Ray Scattering with a Genetic Algorithm, Biophys. J., 74: 2760-2775. Andrade, M.A., P. Chacón, J.J. Merelo and F. Morán. (1993). Evaluation of secondary structure of proteins from UV circular dichroism using an unsupervised learning neural network. Prot. Eng. 6, 383-390. For a complete list of publications see http://chaconlab.org/publications.html. J.I. Garzón. (2010) in Computer Engineering at Computense University Madrid (UCM). 2004-2005 Fundación BBVA (PI) . 2008-2012 Human Frontier Science Program - RGP0039/2008 (co-PI). 1995-1999 Spanish predoctoral fellowship Ref: FP94-35310411 (B.0.E. 23.11.94). 2000-2001-2003 Postdoctoral training award from the La Jolla Interfaces in Science Interdisciplinary Training Program/Burroughts Wellcome Fund. 2001-2003 Spanish Post-doctoral fellowship Ref. EX2001-35310411 (B.0.E. 2.11.2000). 2004-2007 Tenure Track Scientist Ramón y Cajal. Biophysical Society, Spanish Biophysical Society, Sociedad Española de Bioquímica y Biología Molecular (SEBBM).